we have to work just a little harder to find launch spots as lovely as this….. While searching in Southern Maine – via Google Maps – I spotted the Crooked River. the aptly-named Crooked River. Clever! From above, you can see how it got the name. I had to paddle it! Well, that would be WE had to paddle it since I sure can’t reach to get the kayaks off and back onto the Jeep roof! Need this Tall Guy (under the bridge and looking pretty small) to load the boats! We jumped in the Jeep – well, maybe not “jumped” as we left EARLY in the morning to ensure we could get a parking spot at the Sebago boat launch. After an hour-long drive through middle Maine, we found Crooked River. 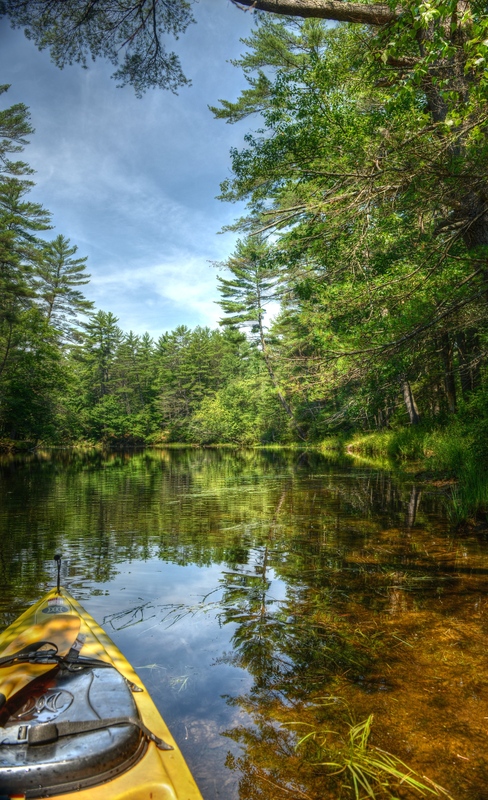 The Crooked River dumps into the Songo River, which empties into Sebago Lake – a 12-mile long body of water. The lake is glacier-formed with a bedrock foundation covered with 160′ thick clay & silt. The Crooked River has a lock operated by the Portland Maine Water District, allowing boats to travel between the river and the Lake. Turning into Sebago’s Crooked River Campground (privately owned) we spotted a kayak rental sign. 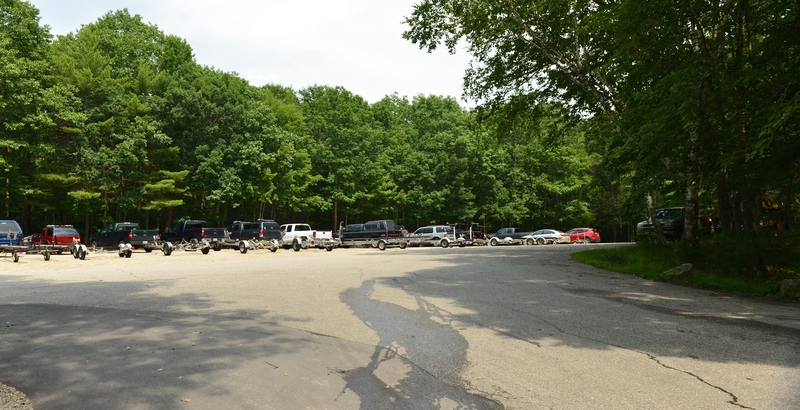 Sometimes, if you ask nicely, a private outfitter will allow you to park and launch on their property and this was the case at this great campground. 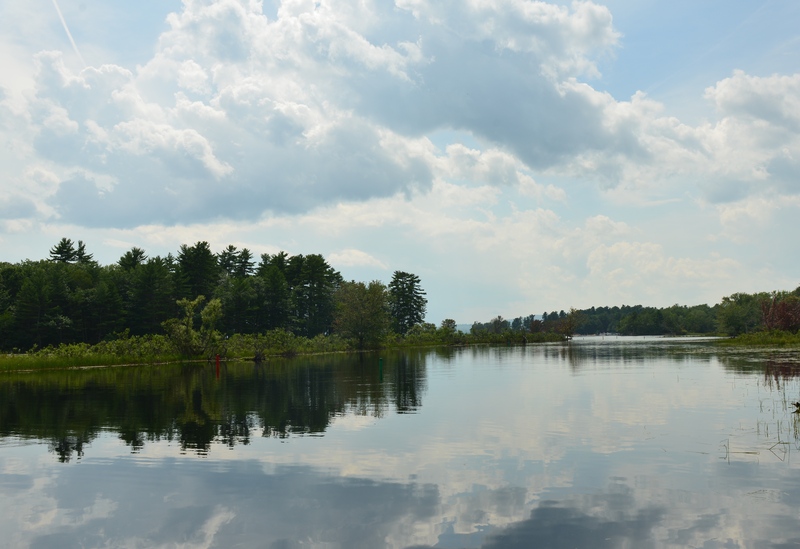 And while we had planned to launch at the Sebago Lake State Park, we had this lucky find instead. The Sebago’s Crooked River Campground was right on the Crooked River. After talking to the very nice owner Lori, she gave us permission to launch from the campground to the Crooked River. Lori & her Husband have owned the campground for a few years making improvements to the property – they plan to add more sites. Kayak rentals and tours are available – as they recognize the growing popularity of the sport. Lori gave me good instructions regarding the river and what to watch out for – not much besides trees and the River lock. Lori (c0-owner of the campground) has an interesting story. She & her husband used to vacation in the area. One day while traveling in the nearby, they wandered through the campground, spoke to the previous owner and agreed to purchase the property that day. Wow! Once we paddled back up the river, we loaded the kayaks (ok, not “We” but tall Husband) and headed back to Old Orchard Beach. Before departing we took a ride through the campground promising ourselves that we would return to further explore the area. The Sebago Lake State Park Boat Launch. We were happy to find the Sebago Crooked River Campground! 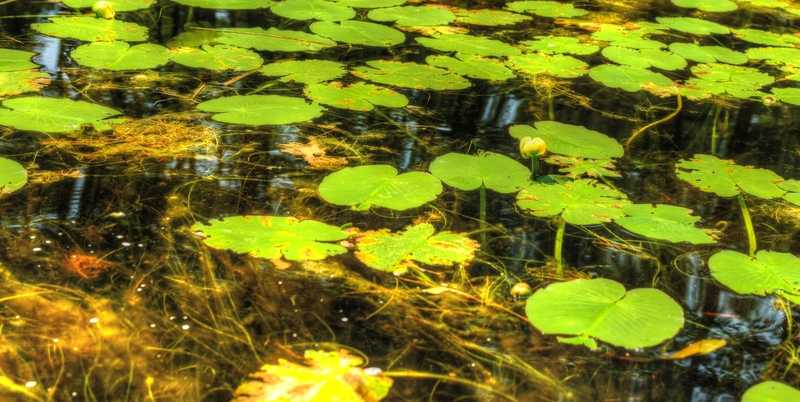 Lots of hiking trails and boating opportunities are available in the area. 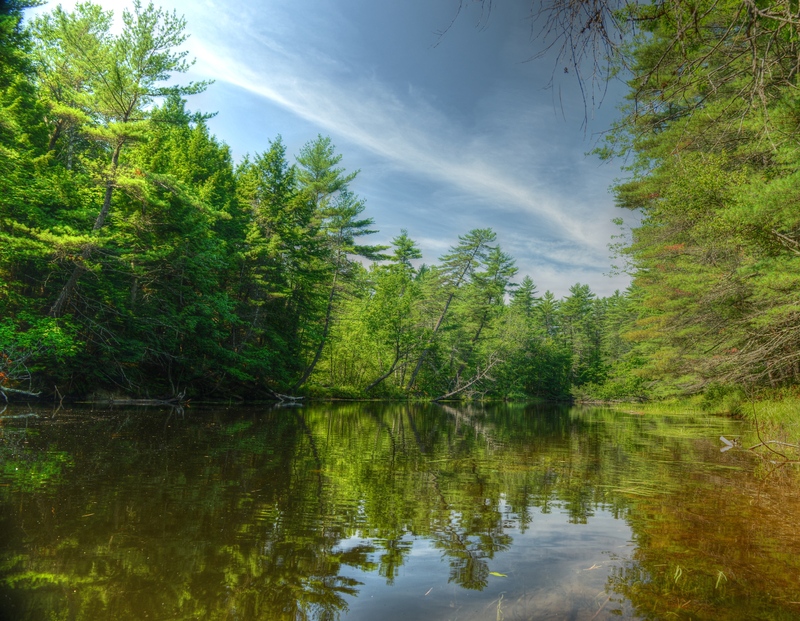 The Portland Water District also runs the Sebago Lake Land Reserve with 1700 acre as near the lake, for your use. With no entrance fee. Lovely! thanks for your note! we enjoyed the paddle and continue to explore the North East! Fun!